When I asked Johnny Matheny if I could shake his hand, I was admittedly a little nervous. The soft-spoken Floridian lost his lower left arm to cancer eight years back. His new arm—an advanced, mind-controlled prosthetic developed by DARPA—can crush a human human skull like a child squeezing a clementine. Of course, Matheny is a professional, and he gave me a very controlled, firm handshake. While you’d never mistake the robotic, carbon fiber arm for its flesh-and-blood counterpart, in terms of dexterity, the two are pretty darn close. If we’re talking raw strength, the synthetic arm is far superior. “This thing has as good a range of motion as a natural hand,” Matheny said in his charming southern twang, explaining how he could greet you with his right hand while opening a car door behind him with his left. “The only thing it can’t do is the Vulcan V,” he added, referring to the universal nerd pride gesture popularized by Star Trek. Matheny is a bonafide cyborg—one of the most advanced in the world. The “Modular Prosthetic Limb” he was wearing when we met at a DARPA technology expo this week is a highly articulated, computer-driven device designed for full neural integration. That means it’s capable of receiving signals from the human brain and, paired with the right surgical implants, transmitting signals to the brain. “The goal is really to capture the brain’s intent and turn it into motion very naturally,” said Justin Sanchez, director of the Biological Technologies Office at DARPA. Sanchez, who was at the Pentagon helping DARPA show off its badass prosthetics this week, explained that the Myo armband Matheny was wearing around his upper arm picks up electrical signals from his muscles. Those signals are transmitted via Bluetooth to a computer inside the prosthetic arm, which drives motors inside the device. In essence, DARPA wants to create a closed circuit that melds synthetic and biological wires. And all of this is just the beginning. 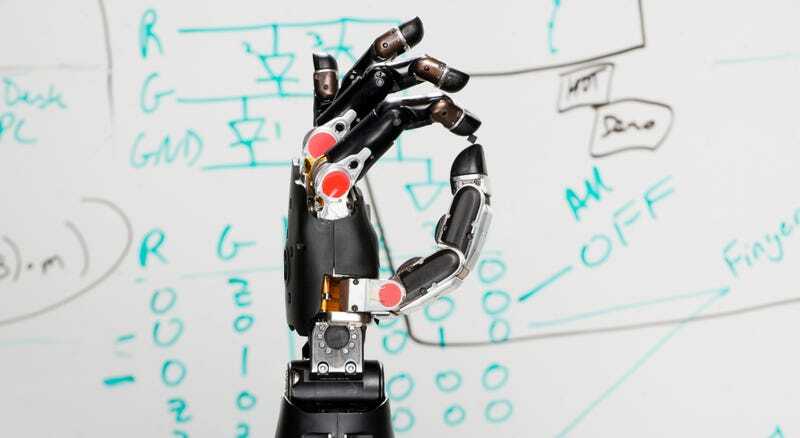 Pointing to his robotic fingertips, Matheny explained that they already contain tactile sensors capable of detecting texture, pressure, and temperature. But in order for Matheny to feel what his prosthetic arm feels, those signals have to reach his brain. In the not-too-distant future, another surgical procedure may enable this. It entails implanting two small devices along nerves bundles in Matheny’s chest and back. These nerves, which are wired directly to the brain’s somatosensory cortex (a region where sensations are processed), would be stimulated based on information beamed wirelessly from the prosthetic hand. In essence, DARPA wants to create a closed circuit that melds synthetic and biological wires. A prototype of an implantable device that receives signals from different muscle groups and transmits them to a robotic limb. Early versions of these implantable devices are already being tested in humans. So far, the result are promising: the technology not only restores a sense of touch, it can dramatically reduce the phantom limb pain experienced by many amputees. The life-changing impact of DARPA’s mind-controlled limbs was clear after spending just a few minutes with Matheny—as was the fact that we’ve barely scratched the surface of this technology’s potential. Devices like the Modular Prosthetic Limb may be expensive and experimental for now, but it’s not hard to imagine them becoming widespread in the future. In fact, I can’t help but wonder whether our cyborg descendants—sporting modular arms that fit tools of all shapes and sizes—will look back on the early 21st century and wonder how humans ever got on with two flimsy, organic meat sticks, equipped with only ten fingers each.